We are going to have a look at what skills are needed in order to set up your first PPC advertisement. 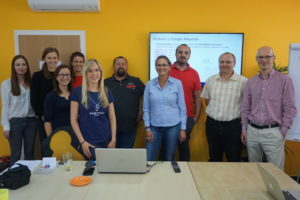 You’ll experience 8 hours divided with Google Partners certified trainer Verča (in the Czech Republic there are only 14 trainers). You’ll receive many practical examples and learn what works and what doesn’t. Individual approach. Maximum of 15 people in a group. Veronika has been working in the PPC environment since 2011. She led a team of 10 specialists at performance ads and web analysis in Sun Marketing Agency. 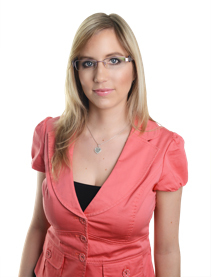 She has experience with online campaigns for clients such as Allianz, Fortuna Game, Asseco Solution and Golden Gate CZ. She’s been freelancing as a freelance consultant for performance online ads for a year. 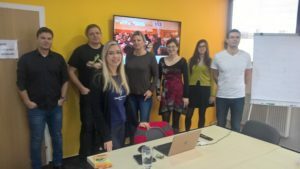 She’s one of the only 14 certified Google Partners trainer for the Czech Republic since February 2016. She managed 3 Google Certification Academies with 70 certified participants. She regularly speaks at conferences, publishes content and trains teams at companies. Become an owner of Google Certification and get new opportunities in e-commerce. You’ll be able to prove your know-how. Now you can show your current and potential clients that you are a certified professional in the area of online advertisement. You can print out your personal certificate and on your public Google Partners profile, there will be a list of all your certifications. This way you’ll help your agency or company get Google Partner or Premier Google Partner. 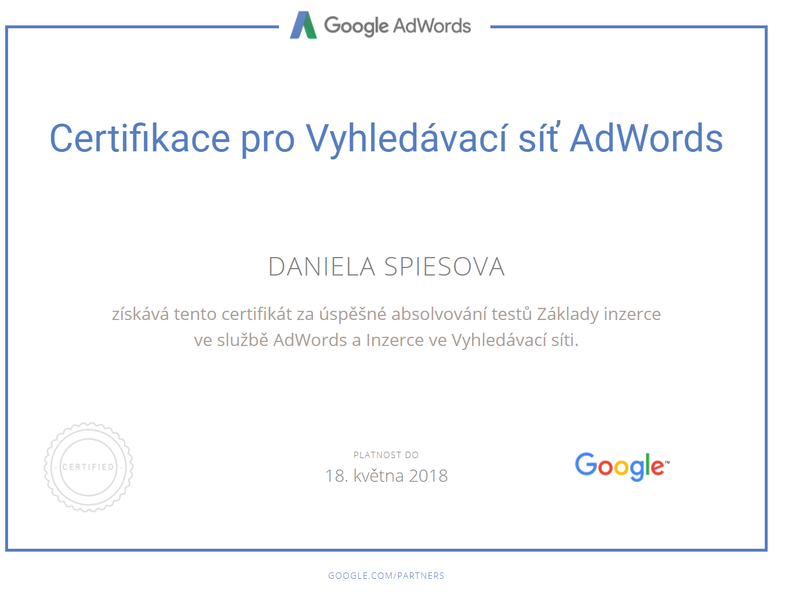 In order to get some of the badges, your agency needs one of their employees to own an AdWords certificate. 1) If you want to get AdWords certification, you need to successfully complete the AdWords Fundamentals test and one other test: Search Advertising, Display Advertising, Mobile Advertising, Video Advertising or Shopping Advertising. Thanks to our training, you’ll be prepared to pass two tests and therefore fulfill the conditions for getting the AdWords Certification in: AdWords Fundamentals + Search Advertising. 2) Each test takes 2 hours to complete. In order to pass, you need to get minimum score of 80%. If you answer YES to one of these questions, then this course is for YOU! Do you want to launch your first PPC ad and you don’t know how? Are you using AdWords daily, but you don’t have a certificate yet? Would you like to work in the area of PPC, but you have very little or no experience in it? Are you supervising the performance of an agency or a freelancer and you need to understand the area of PPC ads? Do you want to get an internationally accepted certificate in the area of online advertisement? The Academy of Digital Economy, Ltd. The training was great! I liked the atmosphere and the level of Verča’s expertise. I gained a lot of information. Verča is a great trainer. Training was very beneficial. I learned a lot of new information from the area of PPC. I would recommend it to everyone who wants to learn more about Google AdWords. Great work from Veronika, very well prepared presentation and I appreciate the friendly approach of ADEM! Laptop will be useful, but if you don’t have any, pen and paper will suffice. Don’t forget to pack good mood. Will you get me an invoice? Yes, that’s no problem. Just send us invoice information for a company or other person. We are not VAT payers. How and when should I pay you? You can pay via bank transfer after we send you an invoice. Minimum of 3 days prior the beginning of the course. In exceptional cases after our agreement you may pay in cash on the first day of the course. 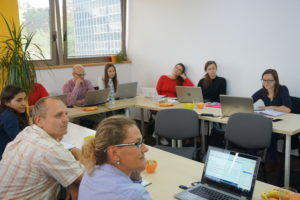 Students, Entrepreneurs, Marketers, and beginning PPC Specialists that want to understand how PPC ads work and want to get internationally acknowledged Google AdWords Certification. What’s included in the course price? Two day course, completing the first part of the exam for Google AdWords Certificate, course materials and small refreshment. What if I can’t attend after all? Don’t worry, we repeat this course regularly, so we can find a solution together such as finding you another course date. 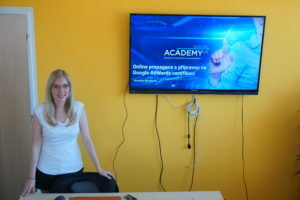 Academy of Digital Eeconomy, Ltd.